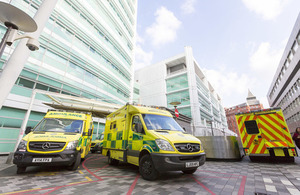 New and updated vehicles will be added to ambulance fleets to help staff provide emergency care to patients this winter following a £36.3 million government investment. Part of the long-term plan for the NHS, the capital investment will increase support for paramedics and ambulance staff. Announced by Health Minister Stephen Barclay as part of the NHS’s 70th birthday this week, the funding builds on the recent announcement that paramedics will be given body cameras to increase protection from violence, in a trial involving 465 ambulances and paramedic teams. London Ambulance Service is set to increase its fleet with an extra 25 double-crewed ambulances as a result of £3.85 million investment, and Yorkshire Ambulance Service will increase its fleet with 62 double-crewed ambulances, due to £7.5 million in funding. Nationally, the investment will buy 256 new state-of-the-art vehicles, more than half of which will be on the road for this winter. Funding will also go towards ‘make ready’ hubs at ambulance trust headquarters, which will allow better restocking and maintenance of vehicles. This will see specialist staff quickly restock, refuel and clean ambulances, getting them back on the road faster. "In some of the most worrying and vulnerable moments in our lives, dedicated ambulance staff are there, providing expert, calm and reassuring care to patients in often highly pressurised and sometimes dangerous situations. "They are there for us 24 hours a day, 7 days a week, so we want to make sure that in the 70th year of the NHS we’re supporting them with state-of-the-art equipment, meaning they can provide a better service to patients." "We welcome this additional funding, which will allow ambulance trusts to begin to invest in new fleets and infrastructure ahead of this winter, when we know they will once again come under pressure. "Our English ambulance services are to be congratulated for successfully implementing a new evidence-based way of prioritising and responding to 999 calls, and early results are encouraging. This additional investment will help ambulance trusts to deliver the quality of service and excellent patient outcomes that are at the heart of the Ambulance Response Programme."